A few months ago, my partner and I sold our Co-Op apartment in New York and bought a house to give our dogs a better life. Some of our friends thought we were a little crazy, but it turns out we weren’t alone! A new study shows that dogs are more important than marriage and kids to millennial home buyers. Let’s look at the stats when it comes to buying a home for your dog and how to help your dog adjust to your new home. Buying a home for your dog? Here’s what to know! Photography by Shutterstock. The new study from SunTrust Mortgage explored what factors contributed to millennials aged 18-36 purchasing homes. One-third (33%) of millennial homeowners said that wanting to provide their dogs with more space — such as yards for dogs — was the driving reason behind purchasing a home. In this study, dogs ranked among the top three motivators for millennial home buyers, and were cited more frequently than current or impending marriage and children. Only 25 percent of those surveyed were looking to purchase a home because of marriage, and just 19 percent said they were buying because of the birth of a child. 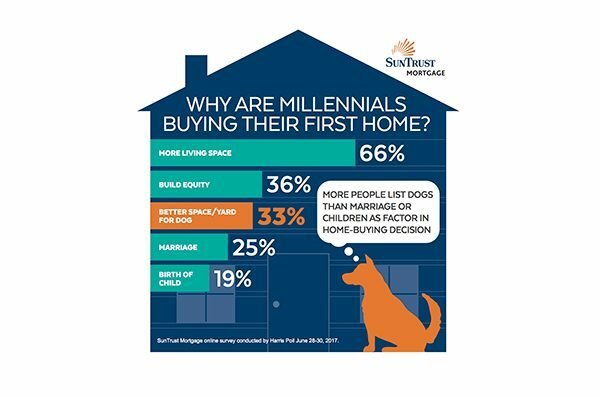 The SunTrust Mortgage study also found that among millennials who had not yet purchased a first home, 42 percent say that their dog, or the desire add a dog to their family, was the key factor in planning to purchase a house in the future! Statistics show that more millennials are buying homes for their dogs. Infographic courtesy SunTrust Mortgage. Anything that keeps the new house similar to the old house will help your dog transition. Dogs like routine, so even small things like putting the water and food bowls in the same place in relation to the crate will help your dog feel secure. Keep the dog bed/crate in the same space, too. If your dog’s bed was in your old home’s kitchen, place it in your new home’s kitchen. Factors like different commute times may throw off feeding and walking times but try to keep things as close to your old schedule as possible. Also, it’s tempting to buy all new stuff for a new house, but let your dog get used to the new home before replacing toys, beds, bowls and leashes. Remember: never be too rigid with routines or it could create even more anxiety for your dog! The most stressful part of the move is the hustle and bustle of the packing boxes and loading the truck. This is a great time to board your dog or send him to grandma/a friend. Bring your dog to the new house once all is calm! Take your dog to the new home several times before you move in. Bring familiar toys and bedding to help your dog instantly feel at home. Get new ID tags that include the new address. Update your dog’s contact information with the microchip company as well! Purchasing a new house or renovating a fixer-upper? Talk with the builder and your real estate agent about avoiding materials that are toxic to your dog. Moving is stressful and might cause some behavioral backslides. Dogs who are fully housebroken may have accidents, or display other behaviors like marking in the new home. Moving to a new home is a great time to brush up on your foundation training. Go back to basics, reward your dog for going potty outside like you would a young puppy or sign up for a refresher course with a local trainer. Look for a dog park or open spaces, beaches or walking paths near the house. Check out dog-friendly Home Owner’s Association (HOA) restrictions and other laws (there are places that don’t allow certain breeds or sizes of dogs — be aware these laws can change even after you buy). A fenced-in yard is a must. If you are purchasing a townhouse or condo, find a fenced-in porch where dog can’t get out between bars or easily jump over. If your new home doesn’t have a solid fence, factor the cost of adding one into your overall home-buying expenses. Seek out dog-friendly floors — wood, tile and laminate are best. Try to avoid carpet. Mud rooms are a bonus! It’s helpful to have a place to wipe your dog’s paws before he enters the home — especially on rainy days. Ensure there’s enough room and storage space for all your dog’s stuff: crates, beds, dishes and more. Find a bathtub that’s sized properly for your dog, or better yet a dedicated dog wash station! The post Buying a Home for Your Dog? You’re Not Alone (Plus, How to Introduce Your Dog to Your New Home!) appeared first on Dogster.